Greenwich Graphic: Saturday, February 23, 1907. Page 1. I was much pleased to receive the Graphic of January 26th, with your able article in relation to the grave and history of my great-grandfather, Maj. Gen. Ebenezer Mead. The statements I know to be correct, for as a boy, in 1845-6 I heard the story of his life and Gen. Put's told time and again by my grandparents and the old people, who were living in Greenwich at the time of Put's ride and who already saw all the occurrences mentioned in my letters and conversations. The grave was also shown me by numerous persons, beside my relatives, for my great-grandfather's house was widely know, and it was the general visiting place of the prominent people of the country, Lafayette was entertained there on the occasion of his last visit to the country. It was a great surprise to me to find that the grave of the most noted man Connecticut had produced in its early history and to be forgotten. Surely it was not forgotten by me. And I made the trip with the two younger ones of my family to show them where my ancestors lived. The western members of the Mead family seem to have prospered, and risen in the world more than those who remained at the ancestral home. I have a son who is one of the great merchants of Chicago and Liverpool, England. I should be much pleased if the people of Greenwich would assist me in erecting a grand monument to one of the founders of their town and to add to the great honorable and historic interest of the already celebrated locality. Wichita Kansas, Feb. 3rd, 1907. Dear Sir -In regard to the monument I've much desire to see a notable monument over the grave of Maj. Gen. Ebenezer Mead, who next to Gen. Putnam was the most noted man whose name was associated with Greenwich in Revolutionary days, and the most noted perhaps of the numerous Mead's of any of Greenwich. "Putnam" and the "stone steps" made Greenwich famous – gave it historical importance and interest. Gen. Mead, his ancestors and descendants, down to recent years owned the eastern slope of Putnam Hill, including the stone steps, also the valley at the foot, where the family mansion stood and still stands extending down to the Sound, or over much of it. Gen. Mead was buried on his own estate, a few hundred feet from the stone steps, on a mound which appears to be a prehistoric Indian mound. I visited the grave site in 1845-6, when I spent a year at the family homestead, then occupied by Colonel Ebenezer Mead, my grandfather, son of Col. Ebenezer Mead -and a graduate of Yale. If I am correctly informed the old homestead has been in our family since 1660 to a recent ____. I referred to Mr. Spencer P. Mead, Historian, of 93 West 43rd Street, New York, for further information and wish you to show this letter to the Editor of the Greenwich GRAPHIC. Also show it to Mr. Isaac L. Mead, of 38 Lafayette Place. Also please send me copies of the previous number of your GRAPHIC which you refer to in your letter, and copies of the GRAPHIC containing any further reference to it. Gen. Mead, from the porch of his house, at the edge of the meadow, was the only person who saw Gen. Putnam ride down the precipice – not the steps – except the six Tories who followed Gen. Putnam to the top of the hill, and they never knew whether he went down the steps or over the precipice. He saw him as he emerged at the bottom, and heard the famous shout "damn ye, I'll hang ye to the nearest apple tree," as the shots they fired flew wide of their intended mark. Gen. Mead told the story to Jabez Mead, a boy then in about his tenth year whose family were neighbors, and told repeatedly, so that it became firmly impressed in his mind, that Gen. Putnam rode down the hill through the bushes. Jabez Mead, who died in April, 1886, often related the story to the editor of the GRAPHIC. This makes it but two removes, two repetitions, from Gen. Mead, very close indeed, certainly near enough to give it ample credence for such historical need as may be called for. Were this not enough then the confirmation given by Isaac L. Mead, adds to its correctness. His father told him that he heard Gen. Mead tell the same story as told by Jabez Mead as above narrated. It is therefore hardly to be disputed and is assuredly to be accepted over the step fallacy. 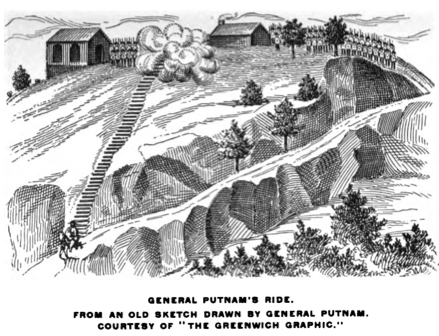 General Putnam's horse was sure footed and he took the hazard of the shortest cut to safety.